There are only two areas that resellers may alter; the reseller logo branding area at upper right, and the reseller contact information at the bottom of the publication. The reseller logo branding area may vary due to the amount of features listed to the right. The reseller contact branding area may vary due to images placed above it. Fonts used in the publications are Arial, Times New Roman, Symbol, and Gill Sans MT. Please contact Mim Young at Digital Retail Solutions if you are having font-related problems (US: 800-322-9471, Canada 800-353-0268, ext 88 — or email Mimmy@digitalretailer.com). Instructions for rebranding are included at the left of the image area in each publication. 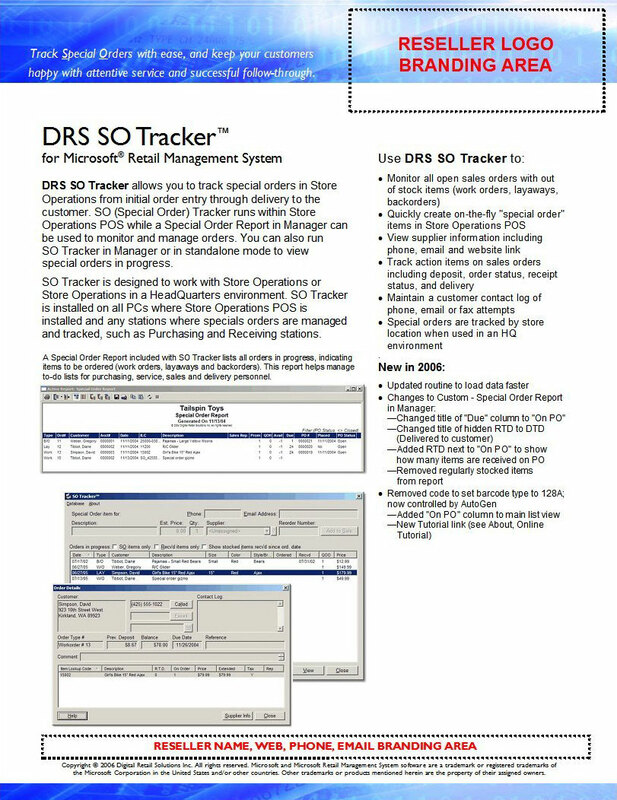 If you have questions about reselling DRS Add-ins for RMS, please email reseller@digitalretailer.com. Resellers may not alter the contents of the text or the images placed by Digital Retail Solutions. 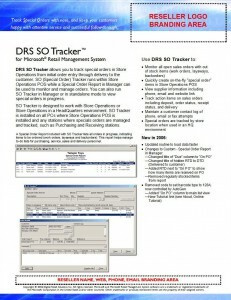 DRS Add-ins for RMS (1-page PDFs).